Before you even voice that question – yes, I know we’re a month into 2011. I’m running late. Oh, you’re not? Funny, that. I thought everyone was. I also thought about ditching this post altogether given its tardiness, but I like the idea of summarizing my year’s reading too much to give it up. In my Best of 2009 post I listed 19 books. This year’s list is more modest, in keeping with my reduced reading pace (thanks much, full-time job). Also, there are a couple of AWESOME books that I read in late 2010 and haven’t gotten around to reviewing. Those will have to go on the 2011 list, I suppose. Disclaimer: not all of the books on my list were necessarily published in 2010. Not all are wonderful literature (gasp! ), but all ARE: moving, or entertaining, or thought-provoking or simply un-put-downable. And I read and reviewed them in the calendar year. Shades of Milk and Honey by Mary Robinette Kowal – This was a case of love at first sight. Shades was wonderful – an Austenish novel with magic (and therefore my ideal book). It was an absolute gem, and packaged beautifully as well. Best recommendation? I bought it for my sister the very next day. Cold Magic by Kate Elliott – A guilty pleasure read to start (or so I thought), which turned into genuine love and a bit of old-fashioned awe at the world-building. For fun, and absolutely for fantasy fans. White Cat by Holly Black – Most unexpected success of the year award goes to this novel. Engrossing, clever, and fast-paced mystery with con men pitted against school kids. Definitely the start of something amazing. I made my brother buy it, and fangirled at a Holly Black signing at ALA. The Kid Table by Andrea Seigel – Start with emotionally honest writing, add in a quirky and self-aware heroine, and a dash of family zaniness for good measure. The recipe? A perfect reading choice before any family event and a great reminder that everyone really is as dysfunctional as they seem (or even more so). The Beastly Bride edited by Ellen Datlow and Terri Windling – All that an anthology should be.With stories inspired by myth and by turns humorous, weird, frightening and wondrous, this collection kept me glued to the page with tale after tale. 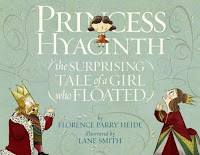 Princess Hyacinth by Florence Parry Heide, Illustrated by Lane Smith – Equal parts sweet, laugh-out-loud funny and poignant, this picture book is one to treasure for many years. Life lessons, uncommon artistic composition and unforgettable text combine to make for a wonderful reading experience. I Am the Messenger by Markus Zusak – Zusak starts us off with a protagonist unraveling a mystery, and along the way finding instincts and strength to survive. Readers along for the ride watch him discovering himself and unexpected bits of life and joy and pain. This novel is a raw journey. It tapped my emotions, and the entire trip surprised the heck out of me. The Moorchild by Eloise Jarvis McGraw – I found this novel through a blog commenter, right here at Adventures of Cecelia Bedelia. McGraw has been a long-time favorite, and to find a new-to-me novel at the same standard of excellence I was always used to from her caused much rejoicing. This book in three words: haunting, lyrical, melancholic. Fire by Kristin Cashore – A companion novel to Cashore’s outstanding debut novel, Graceling, and a brilliant, colorful, wise and difficult book in its own right. And I mean difficult in the way that emotionally challenging things are hard (character building, in other words). Fire is an unforgettable heroine, and the Dells she lives in are a richly imagined fantasy landscape. Into the Wild Nerd Yonder by Julie Halpern – One of the best contemporary young adult novels I’ve come across, and not least because I myself am a nerd (no, REALLY?). I could identify with the plucky girl starring in this story, and was unreasonably pleased that she also had a ‘normal’ nuclear family – something of a rarity in YA lit. Archangel by Sharon Shinn – When I committed to the Horns and Halos challenge (wrap-up post coming shortly) I hadn’t read a single thing by Sharon Shinn. This novel is an introduction ot one of the best in the trade, and the atmospheric writing and descriptions of choral music spoke to my soul – and made me a fan for life. What were some of your favorite books in 2010? There are a few on this list I want to read still, mainly because of your reviews for them. Happy reading in 2011. I was just thinking about trying some more Sharon Shinn in the future. I really liked the Gateway. I hear ya on the rarity of a normal nuclear family in YA. One of my favorite families from last year is the one in Five Flavors of Dumb. I love this list -- I haven't read many reviews on White Cat but what I *have* read has been pretty positive! And that picture book sounds lovely. nice list. i want to try Shades of Milk and Honey. Some interesting choices. I haven't heard of that Datlow anthology, but I have yet to be disappointed by an anthology she's edited, so I'll have to look it up. I love list posts, whenever they appear. It's actually nice to see one after so long! Most of these would be new to me. Thank you for sharing your list!! I've actually never heard of most of these! Adding them to my "list" now! I have not read any of these. Although White Cat and Fire are on my wishlist. I've only read I Am the Messenger, which is one of my favorites ever. I'd love to read White Cat!! Fire was a fantastic novel. Great list hon! Awesome list! I have been dying to read Shades of Milk and Honey by Mary Robinette Kowal . Oh wow, you already have some of my favourites! Fire, White Cat, I also love love LOVED Birthmarked. I am Super interested in I am the Messenger, as Marten Zusak is fast becoming a favourite of mine. Actually, most of the books I haven't read that are on your best-of list, are now on my to-read list ^_^ Thanks! All of these sound so great! I have Graceling and can hopefully get to read it soon. I want to read White Cat super bad! I haven't heard of a couple of these, so I need to add them to my to-read list! I feel ashamed I haven't read any of the books from this list. I'm gonna play catching up now. I want to read few of your list. Happy reading in 2011! Sadly, I have not read any of these books. I really want to read The Kid Table, I Am the Messenger, and Fire! I totally agree with you about White Cat--I enjoyed it much more than I thought I would! And I envy you meeting Shinn's angels for the first time. Fire. Ah, Fire, how I love that book! I really must hurry up and read White Cat already. Cold Magic sounds very intriguing. Several on this list are totally new to me and Cold Magic is already on my must read list. I loved Fire too! It is possibly my favorite from the series. My best of 2010 is hard. I loved Mockingjay (suzanne collins). I also loved Last Sacrifice by Richelle Mead. I absolutely loved Fire as well.